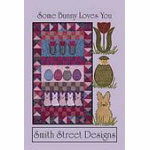 "Some Bunny Loves You" has five applique designs including furry bunnies and fuzzy chicks in a garden of tulips and decorated eggs. Spring inspired pattern includes complete instructions for embroideries and easy pieced wallhanging and table runner. Embroideries use the Large or Mega and Jumbo hoops. Brewer Exclusive Look for additional coordinating items SBLUKIT2 Fabric Kit to make wall hanging and table runner.